Four people are missing after a tsunami hit Greenland's west coast, police have said. The surge of water is also reported to have swept away 11 homes in the village of Nuugaatsiaq. Police chief Bjorn Tegner Bay said he was unable to confirm whether there had been fatalities, according to KNR, Greenland's broadcasting corporation. The authorities believe a magnitude four earthquake caused the tsunami. According to the police chief, it struck off Uummannaq, a small island well above the Arctic Circle. Meteorologist Trine Dahl Jensen told Danish news agency Ritzau that for such an earthquake to hit Greenland was "not normal", as she warned of the risk of aftershocks. 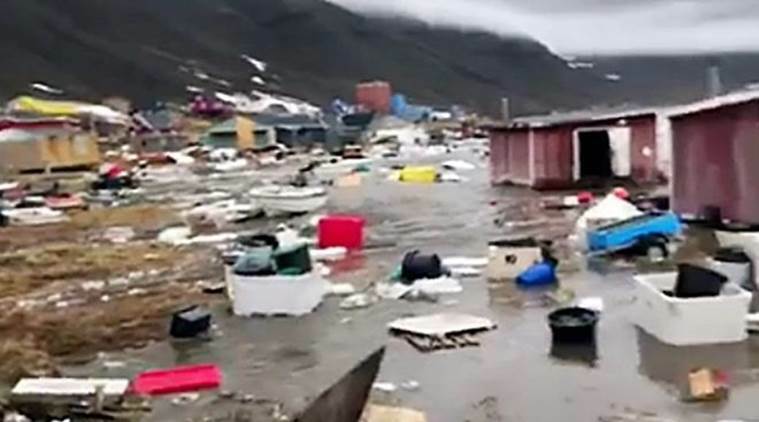 Emergency services were initially called at 22:15 local time (00:15 GMT) to reports of major flooding in the village, the Greenland Police's Facebook page said. There were also reports of waves striking two other villages. A helicopter flying over the area reported "big waves" spotted about 24 miles off the coast. A total of 39 people have been evacuated from Nuugaatsiaq. A number of injuries have been reported.